The notorious Madame Zee was dismissed in her lifetime as a vindictive shrew, but in the hands of accomplished author Pearl Luke, she is perceived in a new light. 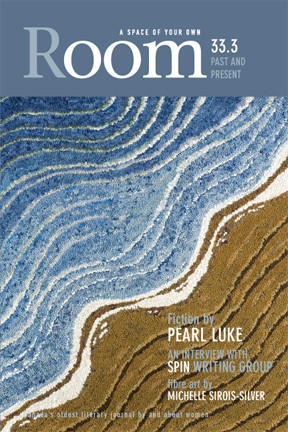 We are pleased to feature Luke’s work in Room’s issue on historical writing, and we hope you will find inspiration in “Writing Madame Zee” as Luke shares her motivation for imagining the life of an unconventionalwoman on an island off British Columbia’s coast. “Depression Glass,” a moving mother-daughter story, also by Luke, follows. Writing the past from a woman’s perspective gained momentum in the 1970s, the decade when Room was conceived, and so I indulge in some nostalgia in “Life after Room.” Since those days of red-hot feminism, women’s exploration of the past continues to deepen. The twentieth century, especially its war years, still provides much fodder, and we present three engaging stories depicting different aspects of the Canadian home front in the 1940s from writers Kristin Andrychuk, Heather Debling, and Lorrie Miller. Some of the poetry selected for this issue also draws upon historical events. Bronwen McRae alludes to a Scottish heritage, while Lauren Carter sees a holocaust in red shoes. Lesley Pasquin draws on the past too, Lesley Washington revisits the Frank Slide, a disaster ripe with metaphor, and Sandy Pool evokes the ancients of Egypt. If you haven’t read June Hutton’s novel Underground, Jen Sookfong Lee’s End of East, or Mary Novik’s Conceit, their interview with Room will surely tempt you. The trio formed the writing group SPIN in 2002, and each has succeeded in publishing her first novel. In a thoughtful and generous discussion, the Vancouver-based women share some of their trade secrets on writing historical fiction. Three more short stories in this collection are bound by the timeless theme of family. Tracy Oliver delivers an assured narrative illuminating a grandmother’s wisdom, Jann Everard shines a light on family bonds, and Valerie Laub’s story involves an elderly woman armed with a camera. Janet Hepburn, and Kelly Norah Drukker writes creative non-fiction with poetic flare as she recalls her search for a beloved dog on a mystical Irish isle. Many more legacies of women’s pasts are still to be written down, as I saw at the annual women’s history fair this spring in Vancouver. I would like to extend a special thanks to the Women’s History Network of B.C. (whnbc.org) for including Room at this event. We were among several women’s groups showcasing our history—from nurses to B.C.’s first Indo-Canadian settlers. I would also like to acknowledge my cousin’s wife, Deanne Fitzpatrick, whose hooked rugs are well known in Nova Scotia. Her work and artist’s blog (hookingrugs.com) inspired the search for the fabric art in this issue. We hope you enjoy the results of our searches and selections. Our dedicated volunteer collective always encourages readers to tell us how we are doing. So consider joining Room on Twitter and Facebook—or write us an old-fashioned letter. This issue of Room magazine is available at magazine stands across Canada this October, 2010.